Is it? Could it possible be? Oh, yes. It’s macaroni and cheese. With hot dogs. Don’t be a food snob. You know you want it. 2. Prepare the pasta according to directions, but drain the pasta just right before it’s al dente. 3. Now, while your pasta is boiling, prepare the béchamel. Melt 3 tablespoons of butter over medium-low heat in a medium saucepan. Add the flour and stir them both together to make a roux. Continue to heat the roux until the flour starts to just brown. Add the milk a little bit at a time, stirring constantly as you add it. It will seize up when you add the first little bit of liquid, but will relax the more you stir it. Add the nutmeg after you have added all 2 cups of milk. Continue to stir and stir and stir. Don’t worry about adjusting the seasoning; the cheese and hot dogs should add enough sodium. Once the béchamel has thickened to a nice, smooth white sauce, turn off the heat and move the saucepan off of the burner. 4. Combine the pasta, the cheese, the sauce, and the hot dogs in a large bowl. Pour the mixture into a good-sized baking dish. 5. Melt the remaining tablespoon of butter and mix it with the breadcrumbs. 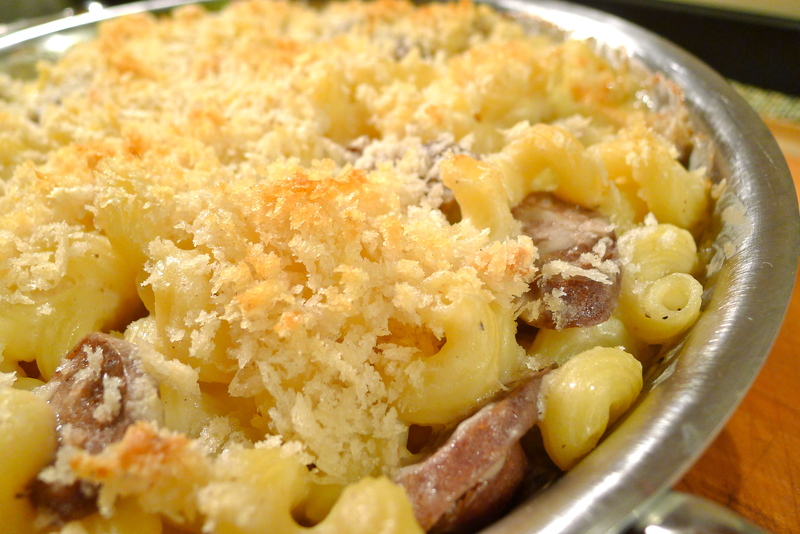 Sprinkle the breadcrumbs evenly over the top of the macaroni and cheese. Bake for 30-35 minutes until brown and bubbly. Serve with a good, heaping side of Midwestern nostalgia.